Frey and Rafi are inseparable . . . but very few people have ever seen them together. This is because Frey is Rafi’s double, raised in the shadow of their rich father’s fortress. While Rafi has been taught to charm, Frey has been taught to kill. Frey only exists to protect her sister. There is no other part of her life. Frey has never been out in the world on her own–until her father sends her in Rafi’s place to act as collateral for a dangerous deal. Everyone thinks she’s her sister–but Col, the son of a rival leader, is getting close enough to tell the difference.As the stakes grow deadlier, Frey must decide whether she can trust him–or anyone in her life. With IMPOSTORS, master storyteller Scott Westerfeld returns with a new series set in the world of his mega-bestselling UGLIES–a world full of twists, turns, rebellion, and intrigue, where any wrong step could be Frey’s last. "In the decade since the original Uglies books ended, I've had thousands of fans tell me how reading the series changed them—and these tellings have also changed me. All that fan fiction, fan art, cosplay, and those critiques have transformed the Uglies world in my head. It's gone from something smooth, pristine, and clean into something more organic, less sterile. Fans brought my world to life. So when the idea for IMPOSTORS struck, it seemed like the perfect opportunity to apply what my readers have taught me. "The original Uglies books were about revolution, the overthrow of an oppressive regime. But getting rid of the powers-that-be is just the beginning. What happens next? History is full of revolutions that falter, revolutionaries who wind up becoming what they fought against. Progress is undone. The question of "what next" kept whispering to me—especially in light of what's happening in the real world. So I had to return to the world of the Uglies to find the heroes ready to take up Tally Youngblood's fight. 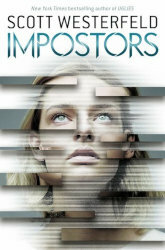 IMPOSTORS is about one of those heroes, Frey, trying to find her true nature in a world where almost everything is false."